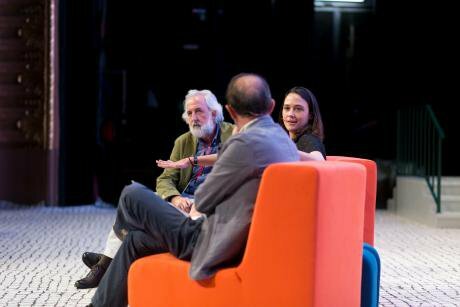 Pía Mancini and Daniel Innerarity during the conference "What Democracy?" at São Luiz Theater, Lisbon. Nuno Ramos. All rights reserved. Manuel Serrano: What can you tell our readers about the state of democracy in Latin America, about the turn to the right in several countries in the region and, particularly, in your country, Argentina? Pía Mancini: I think that this turn to the right has to do with a political system that is trying to respond to the demands of a society that has changed, and failing. I think that, at least in some parts of Latin America, we are perpetuating the logic of populism, which is something that worries me very much. I do not agree with Chantal Mouffe’s proposal that populism of the right should be countered with populism of the left. I lived in Argentina through all of the Kirchnerist years and populisms of the left frighten me as much as those of the right. Populism is populism. Latin America, it seems to me, has always moved in a pendulum. We have lived through various forms of government in the region - military governments, the return of democracy, the rise of neoliberalism in the nineties followed by left-wing populism, and now, back to the right – which have lasted very similar periods of time. I think ours is very much a pendulum movement. There are cycles, and Macri’s election is the response to 12 years of exacerbated, absolutely corrupt leftist populism, which in the end was hardly leftist, only by name. The people in government were the same who voted in favour of the neoliberal reforms in the nineties, so we can say that their populism was nothing more than a ploy to seize power. MS: In this conference in Lisbon you and Daniel Innerarity have been addressing the question of whether "the majority is always right" and you have spoken of "dynamic representation". What do you mean by this? PM: This is what interests me most at the moment. Our established concept of representation is both vertical and territorial. Essentially, what we are required to do as citizens is to abdicate our decision-making power, to delegate our citizenship in a group of professionals who constitute the political class, or the political corporation, and hold positions of power during 4, 5, 6 years, it depends, and only in relation to the territory where we live. So, what we are proposing is to turn around that logic and think of a dynamic, cross-section and much more sophisticated situation – a situation where I would not have to give all the power to someone. For example, I could say I trust that man who has been working in a public hospital for 25 years, and I want him to decide on my public health issues. Or I trust this other person who is a constitutionalist and who is the best at doing his job. This is the game that we can play, this is the sophistication that is now possible thanks to technology. MS: You argue that the use of technology encourages political change and reloads democracy. How can we update democracy in the Internet era? PM: Today we are governed by political institutions that took shape sometime in the past – a time that is not our present. Institutions are not generated in a vacuum, they respond to a given technology, a specific set of values, a particular education, a certain worldview and a concept of citizenship that has changed dramatically since representative democracy was designed. We are not in any way condemned to live under these political institutions, for political institutions must be the ones we choose to give ourselves as citizens. And I believe that today we are at a historic moment where we can - and it is also our responsibility as a generation - rethink these political institutions with the help of technology, and with the level of participation and education that we enjoy. Political institutions must be the ones we choose to give ourselves as citizens. MS: Answering a question from the audience you said that what we are facing is a paradigm shift, not just a change in democratic techniques. Can you explain this? PM: It is not a matter of changing the support or the medium, it is indeed a paradigm shift. It is a matter of rethinking democratic institutions and the type of democracy we want. Democracy is always a work in progress, it is constantly evolving. If it stops evolving, it stops being a democracy - it becomes absolutism. So, it is up to us as a generation, it is our role in history. MS: Can you give us some examples? PM: This has happened to quite an extent in Central America, for example, where agrarian claims by native peoples suddenly moved to centre stage of the discussion and the public agenda thanks to mass urban middle-class support gathered through social networks. In Ecuador, the Society of Good Knowing has managed to recover ancient knowledge, bring it back to the present time, and involve the government, the communities, and the hackers in a space where public policies are defined. The nurses in the city of Buenos Aires are another example. Through the use of technology, they have managed to make their demands visible and push a bill through Congress. Technology is generating new, self-educated citizens and actors who manage to participate in the public sphere through other means. MS: Do you think that providing information to citizens and listening to what they have to say is enough? Would not it be necessary to extend the technological revolution to education, so as to get critical and participatory citizens? PM: The perennial question of preparation! The only way to learn is by doing. If citizens are not well-prepared, this is entirely due to the kind of political institutions that we have, which are only concerned about the game between professionals of the public space, and nothing else. All the rest of society has to remain in the private space, because they are not prepared for participation. So, we have grown accustomed to accepting this notion that we, as citizens, are not prepared. Well, there is only one way out of this, and that is opening up a space for making decisions, experimenting, learning, understanding how these dynamics work, and relearning. The whole system of modern democracy is geared to ensuring that the masses do not participate. So, they are not prepared. Then we have a group of people who devote themselves wholly to it, and the rest of the population is taken up by their private economic activity. The result is the kind of citizens we have: citizens who have never participated. Participation is limited to voting every four years. That is very basic. The whole system of modern democracy is geared to ensuring that the masses do not participate. MS: And what role do you think the media should play regarding the participation of citizens? PM: There is a huge oversimplification of all these questions, and the media are as lost as "a Turk in the fog", as they say. I fully understand they have a difficult task to do, particularly since they are being disrupted by the social networks and the plurality of information outlets that have been generated. Their business model is antique and failing, and they increasingly tend to copy what they see is working, namely the social networks. MS: What tools do we have to deal with populism? Are you worried that the technology may be used for negative purposes? PM: It is the very nature of technology. Take the 3D printers: we should not have 3D printers because they can print firearms. Well, okay, but you can also print a prosthesis that costs $ 50 instead of 50.000. Clearly, technology is not neutral. It can be used for different purposes, and I think the coin is still in the air. Worse still, technology is not perceived as being dangerous, even if it is being used by governments to provide information, to spy on us. So, I think the question of whether “good” or “evil” wins has not been settled yet. 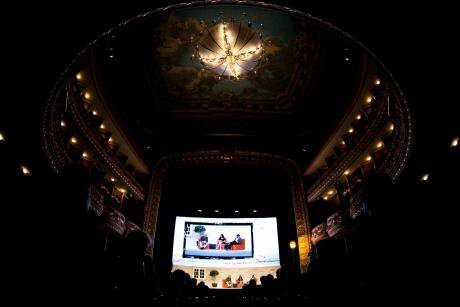 São Luiz Theater in Lisbon, during the conference "What Democracy?”. Nuno Ramos. All rights reserved. MS: You are now living in the United States. What do you think of the possibility that Donald Trump will become the next president? What is your analysis of the current political situation in the US? PM: It is a very polarized situation. Since I will die being an optimistic, I think Trump will not win. But I believe the Republican Party has balkanized itself. Trump is the product of a radicalization of the system, of an exploitation of the system’s resources - a system that has nothing to do with the citizens' demands. So, this is where we are. I sincerely hope that Trump will lose. I hope he loses, because he is dangerous. MS: Last question. What do you think of the victory of the No in Colombia? What do you think of the referendum as a democratic tool? PM: I think that what happened in Colombia, and also what happened in the UK with Brexit, has to do with political elites wanting to settle their internal conflicts through the citizens by putting forward a false dichotomy between "yes to everything" and "no to everything" on issues that are much more complex. What we have done at Democracy Earth, the organization I am involved with, was a digital plebiscite on the Colombian peace agreement. But we broke it down into different clauses: 4 clauses were voted in favour, and one was voted heavily against – the one that said that the FARC should be given the possibility of becoming a political party. Which comes to show that, in the end, the public is ready for a much more sophisticated discussion than the simple "yes" or "no" proposed by the government. They played for all or nothing and they lost. The victory of the Yes was absolutely random. The weather was awful, few people went to the polls... Again, what we have here are political elites incapable of resolving their own conflicts who decide to pass the ball to citizens and call it democracy.